Business Model Generation is a handbook for visionaries, game changers, and challengers striving to defy outmoded business models and design tomorrow's enterprises. If your organization needs to adapt to harsh new realities, but you don't yet have a strategy that will get you out in front of your competitors, you need Business Model Generation. Co-created by 470 business model practitioners from 45 countries, the book features a beautiful, highly visual, four-color design that takes powerful strategic ideas and tools, and makes them easy to implement in your organization. It explains the most common Business Model patterns, based on concepts from leading business thinkers, and helps you reinterpret them for your own context. You'll learn how to systematically understand, design, and implement a game-changing business model - or analyze and renovate an old one. Along the way, you'll understand at a much deeper level your customers, distribution channels, partners, revenue streams, costs, and your core value proposition. The authors believe a business model can best be described through nine basic building blocks that show the logic of how a company intends to make money. The nine blocks cover the four main areas of a business: customers, offers, infrastructure, and financial viability. The nine business model building blocks form the basis for a handy tool, which we call the Business Model Canvas. This tool resembles a painter's canvas - performated with nine blocks - which allows you to paint pictures of new or existing business models. 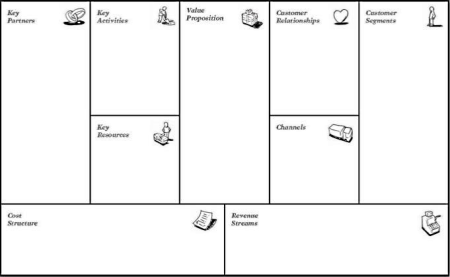 The Business Model Canvas can be used to develop a business model or it can be used to gain an understanding of the strengths and weaknesses of an existing business. Into each box of the model you can enter a detail of your business model. If you're entering information about an existing business, you can indicate if this aspect of the business is a strength or weakness. Reader Michael Uschold says, "This is an absolutely superb book and my first and only book on business models. It is so up to date and filled with gems that I feel no need to read another anytime soon. 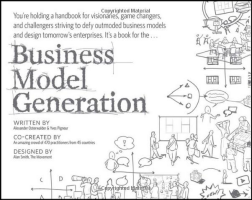 The book is aptly titled, being all about how to generate business models. However, you have to know what it is before you can generate it. To this end, the first section of the book is devoted to introducing a standard language and format for talking about business models. They introduce nine key items which serve as the building blocks for all business models."